- Install Myanmar Keyboard app. Enable it in settings with Myanmar keypad embedded. - Open Myanmar -typing app where you want to type. Start typing. - If you want to turn it into Myanmar keyboard just turn Myanmar keypad for Android in settings and update your status and sent messages to your loved ones. - Enjoy Myanmar writing with beautiful Myanmar Keyboard. - Myanmar keyboard has extra icons, numeric, and special characters that make your text persuasive. 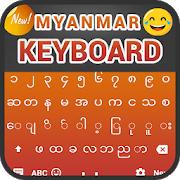 - Alter the keyboard From Myanmar to English and from English to Myanmar using this Myanmar Keyboard. - Myanmar keyboard will allow you to write in Myanmar language. - Many themes are designed, select your desired one that most suit and write in Myanmar language. - Thousand plus Emoji, emotion, smiles are designed to make your Myanmar Text impressive.